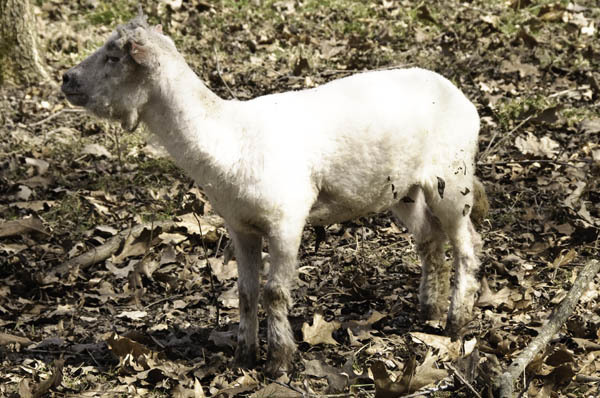 Tiny, the bottle lamb, is grown up now and having hair issues. Actually, she has a lot more issues than just her bad haircut, but that’s a story for another day. A year ago, Tiny was a fat, spoiled lamb. Most days she appeared neatly groomed, except for the bits of leaves and mud spots she picked up running about the farm with the dogs. Back then she thought she was a dog. She still has identity issues. 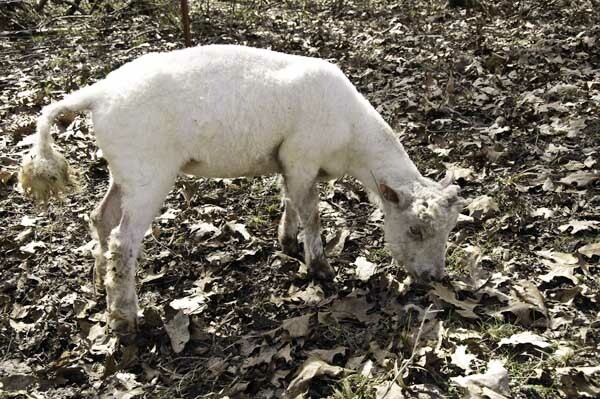 By winter, her wool was long and thick — and eventually, kind of motley looking. She needed a haircut badly. All the sheep did. I touched base with the shearer but we didn’t set a firm date for him to come out and shear our little flock. Snow issues. Mud issues. We decided to wait for the mud around the barn area to dry up a bit, then set an appointment. Then came Tiny’s big escape. Actually, Tiny slips past me at the gate several times a week, but if I’m quick I can catch her at the scruff of the neck. This time, though, I grabbed for the scruff and stripped a fistful of wool off Tiny’s neck. YIKES! It apparently didn’t hurt, though. She never missed a step as she bolted past me and darted into the duck pen to steal a snack from their feeder. Never one to waste good spinning wool, I tucked the wad of neck wool into a pocket and hurried after her. I grabbed her to pull her away from the feeder, then carefully tested another spot of wool. It peeled right up. The bare spot wasn’t really bare either. 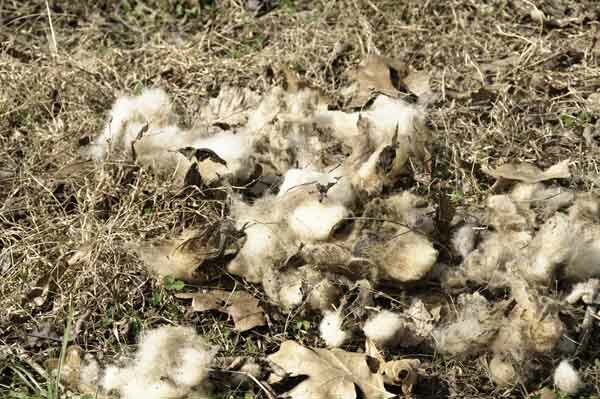 A creamy layer of new wool covered it. Hmmm. It took just a few minutes to coax the sheep into following me to their day pasture, then I wedged Tiny between my knees so she’d stand still. Then I went to work on the rest of her coat to see just how much would come off. To my surprise, it all did. It took me about 15 minutes of actual plucking to harvest her entire coat, and except for a few tufts around her face and at the end of her tail, it all came off easily. The other sheep aren’t shedding. Not even her twin brother, who’s standing at the right in the photo above. I have no clear explanation for why Tiny blew her coat off and the others didn’t. 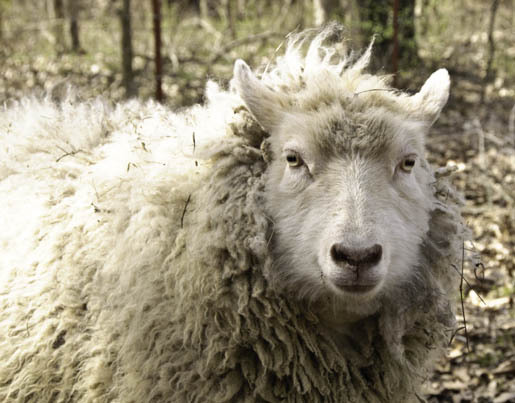 The sheep all are crossbred, and all are part Shetland. 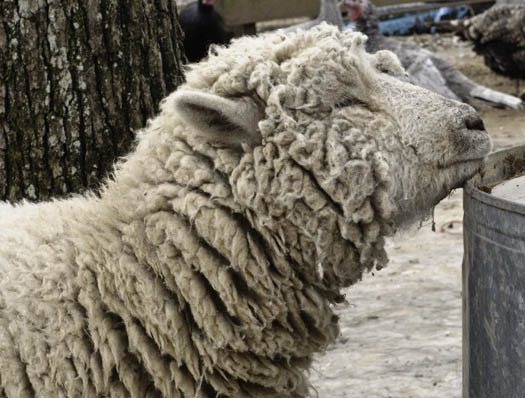 Like some other primitive sheep breeds, Shetlands will often shed clumps of wool in late winter or early spring. 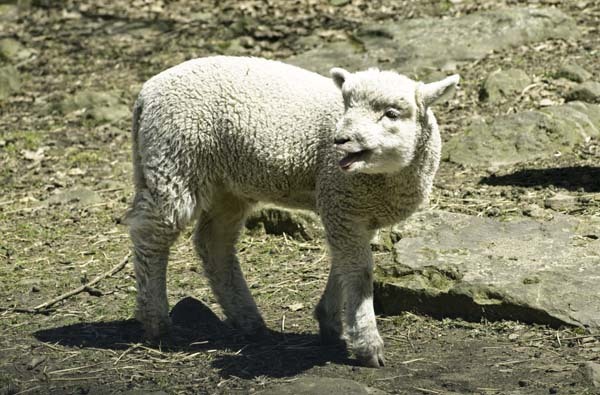 Long ago, the Shetland Islanders commonly would roo the wool — i.e. pluck it by hand. The wool was spun into yarn, and that’s exactly what I intend to do with my unplanned rooing of Tiny’s wool. 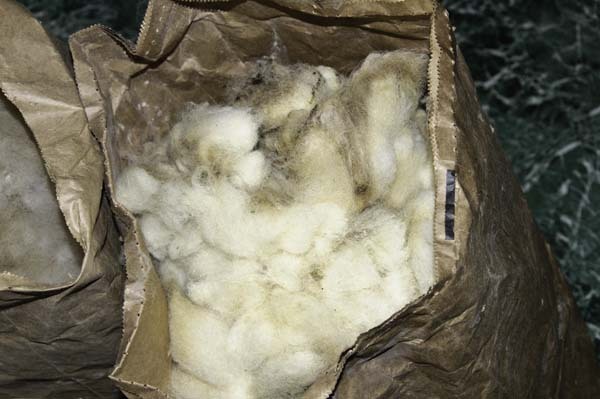 Most of the wool is now stuffed into a feed bag for temporary storage. It still must be washed and either combed or carded before I can spin it into yarn on my spinning wheel. 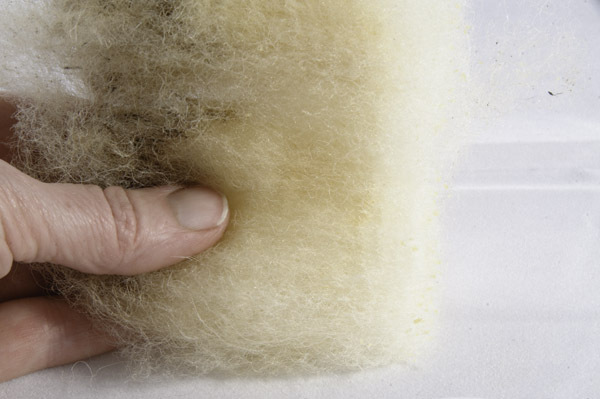 Tiny’s wool is relatively short, about 3 inches long, but in good condition with a nice texture and lots of lanolin. That lanolin is good for the skin and fingernails, and my hands certainly were softer and well moisturized after I finished Tiny’s grooming. I left the belly wool, manure tags, and other substandard bits of wool on the ground for the birds to gather for use in their nests. Now, who’s next? What are the odds that Peep and the rest of the flock will follow Tiny’s example? Is Tiny going to “Roo the Day” you plucked her? Ha ha ha, get it… “rue”. Fine, nevermind. 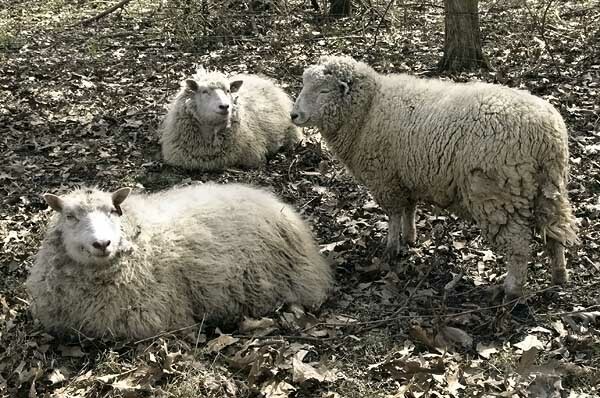 It might be interesting to see if you could create a breeding stock of these “self-shearin” sheep!